I don’t know whether to laugh or cry. The internal dialogue I have about this is enough to send anyone mad. Its crass and cheap looking, but boy is it funny! Pour yourself a nice hot brew and each time you raise the mug to take a sip, listen to one of the most famous movie theme tunes of all time! This coffee mug plays “KNIGHTS OF THE ROUND TABLE; the sound is activated by a light chip each time you raise the mug to take a sip. 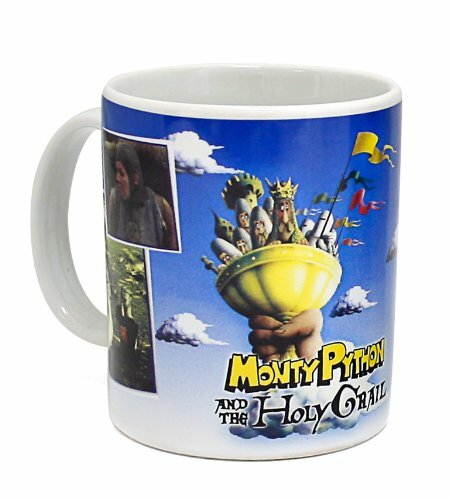 The mug itself features Terry Gilliam’s famous graphics plus scenes from the movie. Fantastic gift for Python and Life of Brian fans everywhere! Python has been broadcast on TV in almost every territory in the world! A total of 45 episodes were made across 4 series!